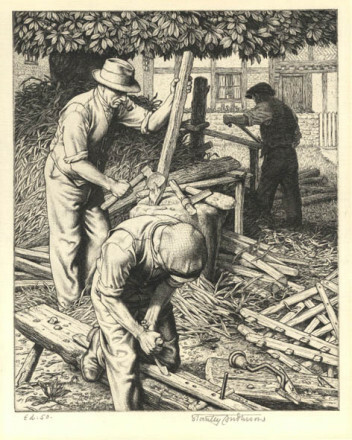 Stanley Anderson was born in 1884 in Bristol, son of an engraver who gave him the initial training as heraldic engraver. He studied in London at the Royal College of Art and at Goldsmiths’ College. Anderson was for many years a member of the engraving faculty at the British School in Rome and in 1938 was chosen by the British Council as the sole British representative of line engraving and drypoint at the Venice Biennale. During his career he won several awards and medals. An intaglio printing process where the lines are scored directly into the plate with a sharp needle, which can be used much like a pen. 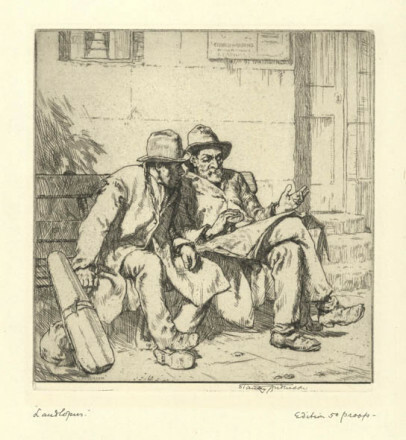 The line leaves a deposit of metal in its wake known as a burr, which when printed holds a small deposit of ink and gives the drypoint line a characteristic softness of tone. Its disadvantage is that such plates wear out quickly, so editions are usually limited to 50 or fewer prints. Drypoint is often combined with other printing techniques.